Remember when I used to post pretty edited pictures? This is not one of those posts. This is real life with lots of rambling and nothing shiny. The coffee shop is almost there! I am so excited. It is literally a block from my house and I am probably going to get kicked out everyday for loitering because I love it in there so much. These two little pumpkins belong to the owner. There is a third who was wandering around under some scaffolding somewhere. In a last minute change order I switched the top that is going on this rounded corner from cararra marble to Corian's Rain Cloud. I love, love, love cararra, but not everyone love, love, loves the upkeep on white marble. And I just imagined coffee rings and it gave me anxiety, so I switched. Fingers crossed we'll love it just as much. We were there last night overseeing the installation of the cafe curtains. I brought my project manager. He is big on job site cleanliness. One of my favorite things is the restroom. I saw the plaid walls Tracery Interiors did in the Southern Living Idea House in Atlanta and I knew we had to do something similar in our little restroom. I may be partial, but I think it's going to be the cutest public restroom in the entire city of Boston. Speaking of Massachusetts drivers, this one almost ran me off the road yesterday. And yes, I am nuts and took a picture at the next light. I want to report him. Does anyone know how to do that?? He had a bus full of little ones with no seat belts on and literally cut over 3 lanes in the middle of the craziest intersection in our neighborhood, no attempt at putting his blinker on and waiting until traffic cleared like a normal person. The thought of my child being on that bus made me so mad. You've got someone's precious cargo on there buddy, drive like it. I am officially a crazy mom. Back to design, this little kitchen is also plugging along. We didn't actually hire a GC for this one. I have basically been the GC, which is not a roll I typically serve. But we are getting there. We had Ikea cabinets custom painted in Benjamin Moore's White Dove. See how pink they are in the photo below? It was terrible. I will do a full Ikea kitchen post on a later date. Granite and lighting are going in next week. Here are some pieces to a master bath I am working on in Brookline. I have never used penny rounds on the floor. I am very excited to see how it turns out. The vanity top is going to be a quartzite called luce di luna. We wanted cararra, but they are thinking of renting down the road and it gave us all too much anxiety. Here are some samples for the sofa and chairs. Last week we ordered a huge custom breakfast table from Tritter Feefer that I am so excited to see. Speaking of breakfast tables, my friend just bought a house in Wellesley and had us over last week for a playdate. She used Dennis Duffy for her previous home and has lots of nice pieces that I got to ooh and ahh over. We had not sat our little ones down for two minutes for a snack before I look over and see my little woodchuck with his teeth hovering, ready to chomp, on the end of her gorgeous Knoll table. I almost had a heart attack. He has obviously not inherited his mama's appreciation for the classics quite yet. Or maybe he just loves them so much he wants to eat them??? And last up, I have a client in Chestnut Hill that I have been helping here and there. She wanted to buy some inexpensive storage pieces for her daughter as she was upgrading from a nursery to a big girl room. 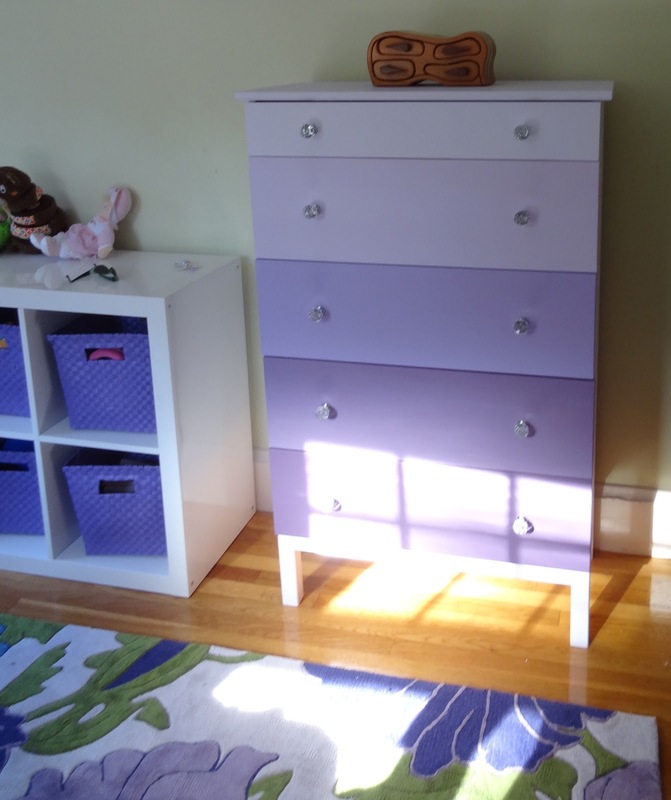 She loves purple, so we bought the very inexpensive Tarva dresser from Ikea, perused the fan deck for shades of purple to go with the very affordable rug we also added, and my furniture painter guy made it happen. I think it turned out super cute. That's it over here! Hope everyone is enjoying the gorgeous Fall weather, we sure are! p.s. I get a lot of comments/ emails about the coffee shop. It's called Neighborhoods and is at 96 Peterborough St. in Fenway. I think if all goes as planned she will be open the first week in November. She plans to do story hour for the kids, a music night with Berkeley students...it's going to be an awesome little place. HERE is the website.